The classic board game Cluedo was created by solicitor’s clerk Anthony Pratt and published by Waddington’s way back in 1948. Cluedo is a classic game of whodunit a sort of murder mystery that the players involve themselves in as they try and determine the murderer of Mr Black, the owner of the mansion players are staying in. Cluedo is a lot of fun and you don’t need to be Sherlock Holmes to play it. Most people have probably played Cluedo, watched Cluedo being played or have at the very least heard of the game. Cluedo (also known simply as Clue in the US) is a board game with the board set out to look like the top down view of a mansion, cut away to reveal the nine rooms. Each player is represented by a particular guest within the mansion (6 in all).Before start of play three cards are randomly chosen and placed in an envelope. No players see these cards, with one representing the suspect, the weapon and the room the murder took place in. All other cards are used within the game and it is the objective of the players to correctly name the cards in the envelope, thus solving the murder. 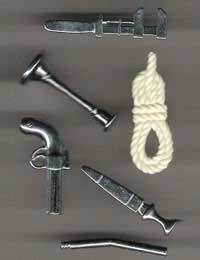 In order to win at Cluedo the players must use the clues gained as game play progresses to solve the murder. This is done by players stating a suggested MO for the act. Generally this will be stated as “I suggest that it was Mrs White, in the dining room with the knife”. This suggestion may only be made whilst the suggesting player’s piece is in the room being suggested (in this case—the dining room). This statement can then be disproved by the other players in a clockwise motion by placing one of the cards within the suggestion face up. This is done by the next player in a clockwise motion when possible, if players taking a turn after the card is shown also hold a clue (perhaps the dining room card) this is not shown. Only one clue card is shown, this gives the player holding the other clue card additional information as they now know it did not take place in the dining room. If a card is shown, for example the knife card (by another player), this shows the card is unable to be in the envelope and that therefore the guess is incorrect. This is how the players narrow down the clues. It still may well have been Mrs White in the dining room, but clearly not with the knife. Making an accusation in Cluedo is a little more in depth than making a suggestion. A player can, when he / she believe they know the murderer, weapon and place of the act, make an accusation. This is similar to the suggestion, but the player making the accusation gets to look at the 3 cards in the envelope to see if he / she is correct. If they are correct the game is over and that player is the winner. If on the other hand they are incorrect, they must leave the game immediately, only playing on to reveal cards when prompted to do so. As with the suggestion, the accusing player must have their playing piece in the room they believe the murder took place. The popularity of Cluedo has meant that it has been reincarnated in many varying forms. These include spin-off and add-ons for the game along with many themed versions. Spin-offs include various PC versions of the game, card games, anniversary editions, Super Cluedo and Cluedo Junior. Themed editions include The Simpsons, in which players try and solve the murder of the evil Mr Burns. There is also the Haunted Mansion, a Disney version based on the Haunted Mansion attraction at the Disney theme parks. Scooby Doo Cluedo, sees the ‘Scooby gang’ trying to solve the murder. The board in this edition is slightly different with the addition of a cemetery area. Finally there is role-playing favourite Dungeons and Dragons Cluedo, which features D&D characters trying to solve the murder. Weapons and the board derive from the D&D world also.